Irwin Weiner ASID - If you're wondering why such contrasting and disparate colors are selected each year, think public relations, consumer product sales, and editorial flights of fancy. There is nothing sacred about a "color of the year," except to draw attention to a particular color that perhaps should get a little more monetary love for everything from paints to fashion to home goods. Color trends may also be a product of current events - Ultra Violet, the neon purple 2018 Color of the Year from Pantone - is both strong and feminine, and it's a perfect design story for our #MeToo times. And, yes, Prince would be proud. Do you want a darker color statement? You'll get darkness and sophisticated neutrality in spades with Glidden's Deep Onyx. This kind of neutral has been a staple forever in home design because, like white and beige, it can recede and allow other colors to pop or it can add drama and depth as an accent. It's also timeless, whereas other colors are more faddish. Add Deep Onyx to red and you'll come up with the darker red of Benjamin Moore's color of the year, Caliente. You can see that it makes the same strong accept color and is in that "a little goes a long way" range along with Ultra Violet. It doesn't pass my colors that would be great for the majority of walls in a room, which I call the Suit Test. Would you have a suit made of Ultra Violet or Caliente? Not likely, but both colors would make good accent colors on a tie or pair of socks. In the photo above, Ultra Violet really jazzes up a neutral decor and gives it a bold, fresh feel. Deep Onyx would make a lovely suit, of course, making you look sophisticated rather than clownish. But everyone has different tastes, and colors provoke lots of debate. 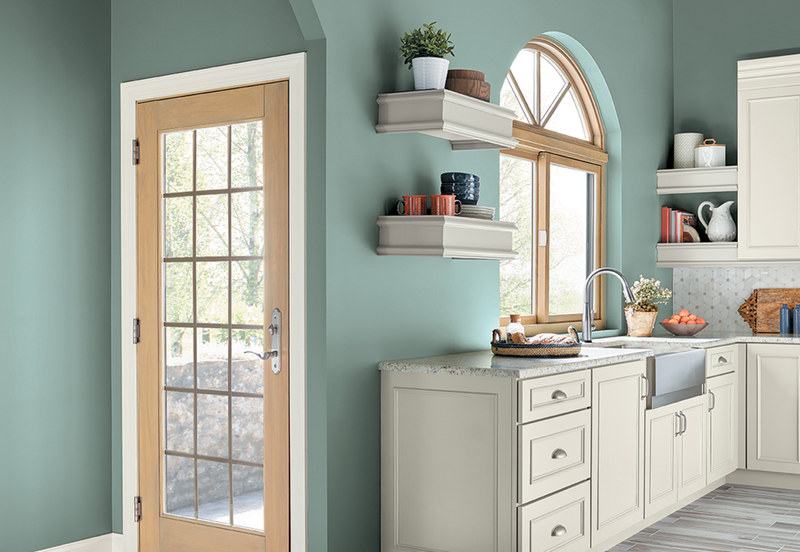 I like the soft green-blue of Behr Paint's color of the year, In the Moment. There's a freshness about it that makes me think of a Veranda magazine interior. 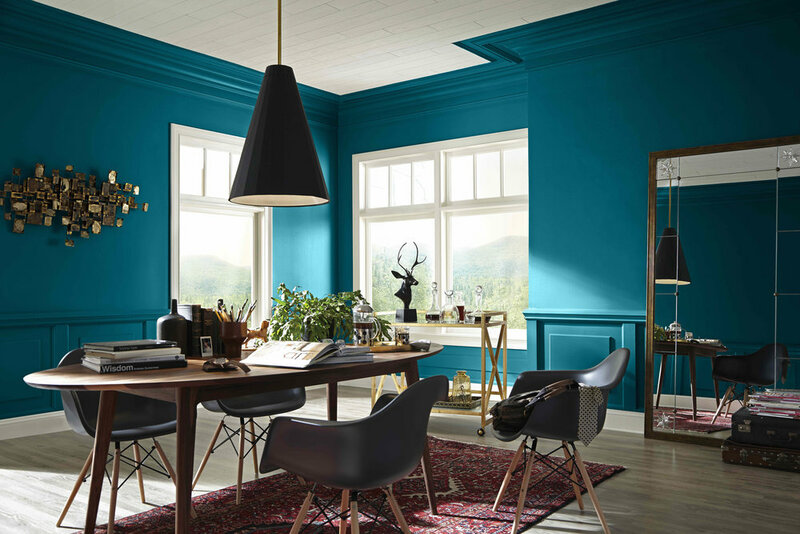 Darken and intensify that green-blue combo, however, and you'll get Sherwin-Williams color of the year, Oceanside, which is a combo of "rich blue and jewel toned green." It's yet another one of those strong, dark accept colors that seem dominant in 2018. So what's your favorite color of the year?